Those of you who follow my blog know that the tag line for my podcast has always been that this space is a discussion for the topics of “education, technology and history”. This post is a combination of all those topics but this time they collide in an unlikely location – Kaufman Stadium, home of the Kansas City Royals major league baseball team. I have blogged for the past six years and in the past couple of years I have become a fan of Twitter. Those of you that know me outside of the classroom also know that I enjoy following the Kansas City Royals. During the season I often tweet about the Royals while I watch at home or am sitting in the stands at the K. So when I saw a tweet about a week ago from the Royals asking for applications to attend a game as a social media member - "Blog Your Way to the K" - I jumped at the chance. I was selected as one of the eight social media members and graciously accepted their invitation. 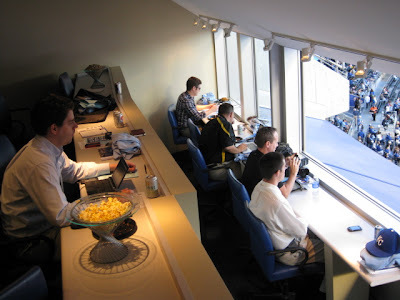 I arrived at Kaufman Stadium on Tuesday night armed with my digital audio recorder, a Flip cam, a digital camera and my Droid phone – ready to report for duty as a member of the new age media. I felt relived to discover that joining me on this crazy adventure was another teacher – Sean Nash of St. Joseph, Missouri. Some of the participants maintain incredible, up to date blogs which cover the Royals. 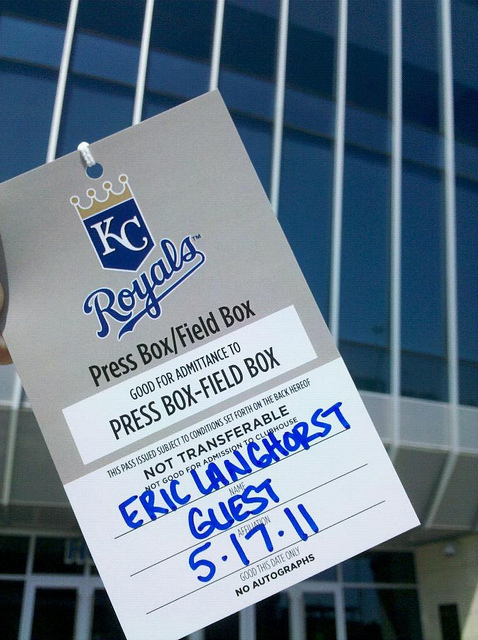 Several of us were a little lighter on Royals content and selected because of our familiarity with social media. It was clear from that start that we were the guinea pigs. This was the first time the Royals had invited social media members to a game and provided access to some players and members of the organization. In this circumstance being a guinea pig was more than alright. 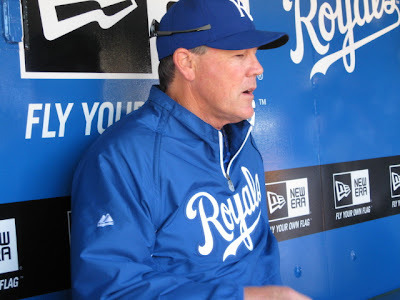 Before the game we met with Ned Yost and were allowed to ask questions of the Royals manager. We had similar question and answer opportunities with players Eric Hosmer and Bruce Chen during batting practice. All time Royals save leader Mike Montgomery spent time answering our questions before we headed up to where we would watch the night’s action between the Royals and the first place Cleveland Indians – a suite attached to the press box complete with food, comfortable chairs and an incredible view. We were provided a Royals media guide, game day stats, a scorebook and a couple of t-shirts to take home. In the suite prior to the first pitch we had a question and answer session with Royals broadcaster Ryan Lefebvre and Royals General Manager Dayton Moore. The discussions were candid and much of the talk centered on the roster moves of the day including the call up of Danny Duffy. There was a lot of baseball “shop talk” and I enjoyed the insider view of the team but threaded throughout the conversations of the evening was the theme of social media and how it fits into the timeless traditions of baseball. There were numerous examples of how the rapidly changing social media landscape is changing the business of baseball. Mike Swanson, the Royals VP of Communications and Broadcasting, discussed how earlier in this career he would spend considerable time gathering newspapers from around the country with stories on a variety of games, fax them across the country to the manager and keep notebooks full of notes. He smiled as he commented, “Today you have all that instantly on one i-Pad.” Granted, Ryan Lefebvre still has his “Big Blue Book of Knowledge”, which he mentioned in his discussion with us, but the times are a changn’. 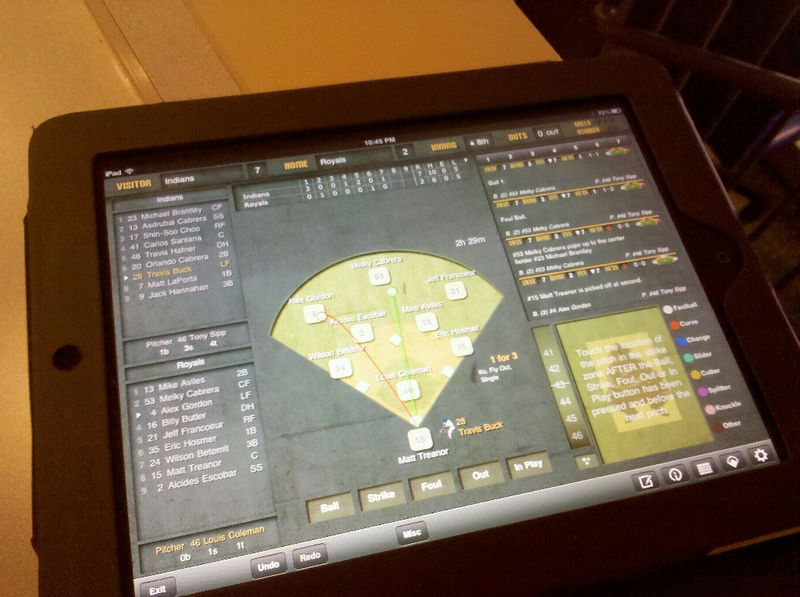 The geek in me was impressed when Fox announcer Joel Goldberg showed me how he uses the i-Score app on his i-Pad to keep score. The amount of time saved in gathering information compared to 20 years ago is staggering. I was also intrigued by the Royals approach to players blogging. Mike Swanson discussed how the Royals ENCOURAGE their players to actively use Twitter and Facebook. He added it can be a very powerful way to connect with the fans, as long as they use it wisely. He discussed an example of when a player innocently tweeted earlier this year about a friend getting the call up to the show before it was officially announced (BAD) and how some teams have players Tweet out they are hanging out in a location and they have 20 tickets to give away (GOOD). We talked to Eric Hosmer about how he uses Twitter a little right now. Bruce Chen doesn’t currently have a Twitter account but seemed to warm up to the idea when we explained that you only have to type less than 140 characters. David Holtzman, Director of Media for the Kansas City Royals, also spoke about a willingness for the players to positively use social media as a way to connect with the community. My general feeling for the night was that the Royals aren’t really sure how to fully incorporate or embrace social media but they see it has tremendous potential and they aren’t afraid to give it a chance. My personal light bulb moment of the night came when Sean Nash said, “Baseball is trying to figure out social media in basically the same way that education is trying to figure out social media.” I thought that was brilliant. Education need to take the same approach and see social media for the potential that it does provide if used in a positive manner. If baseball, one of the most tradition entrenched cultural icons in American history, can give social media a try surely our educational system can as well. The Royals fell to the Indians 3-7 but the game was an experience that I will never forget. Every member of the Royals organization we met was first class and showed us great hospitality - Erin Sleddens, Mike Swanson, David Holtzman, Mike Montgomery, Ryan Lefebvre, Joel Goldberg, Dayton Moore, Eric Hosmer, Bruce Chen and Ned Yost. I would also like to thank all the fellow bloggers who I shared the experience with on Tuesday. I walked away both entertained and impressed with your talents. The Royals told us they were impressed by the response to the event and they are hoping to have another “Blog Your Way to K” event later in the year. The organization also commented on the possibility of creating some promotions for fans via Twitter at Kaufman Stadium. I would encourage all fans to follow the Royals on social media like Twitter and Facebook. They provide a wealth of information prior to, during, and after the game. Thanks again. I am also sharing some of the photos I took during the event as a Flickr set if you are interested.